Awwww Miley and Nick were caught chatting and smiling at the 2009 KCAs. I’ll admit, this made me smile a bit, it was cute. To clear any rumors before they start up, they are just good friends, no they aren’t dating, and Miley is happy with her current boyfriend. A slew of tickets for the Jonas Brothers [ tickets ]‘ upcoming world tour hit the box office this past weekend, and the pop trio’s fans wasted no time snatching them up. The sibling act sold a combined total of more than 800,000 tickets for upcoming tour stops throughout North America, and posted sellouts in New York; Los Angeles; Chicago; Philadelphia; Washington, DC; Houston; Pittsburgh; New Orleans; Atlanta; Los Angeles; and Edmonton, Alberta, according to tour promoter Live Nation. In response to the demand, the group immediately rolled out second shows in Los Angeles, Chicago and Philadelphia, as well as Vancouver, British Columbia. 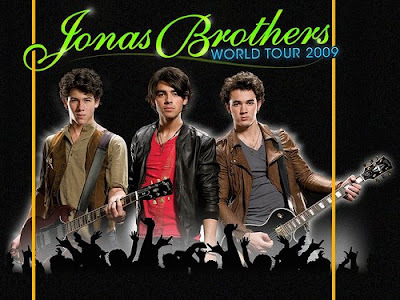 As previously reported, “The Jonas Brothers World Tour 2009″ kicks off June 20 in Dallas and will touch down at arenas and stadiums across North America through an Aug. 31 finale in Ottawa, Ontario. The US jaunt comes on the heels of a short South American leg in mid-May, as well as sold-out shows at Paris’ Zenith Arena and London’s Wembley Arena in June. The band’s new Hollywood Records effort will hit shelves worldwide June 15, just in time for the stateside trek. Each show will include a massive, 140-foot stage centered in the arena, allowing for better views throughout the venue. Other ambitious features–such as a one-of-a-kind water screen, laser and automated video effects and a giant crane over the audience–are also expected to wow the mostly female crowd. The Jonas Brothers’ world-tour announcement comes nearly two weeks after the debut of their new Disney movie, “Jonas Brothers: The 3D Concert Experience.” The pop trio celebrated the new release with moviegoers, jetting around to select US cities and surprising fans with impromptu performances. Yes, sure you might have seen the Jonas Brothers on the KCAs getting slimed, but have you seen the aftermath of the slime? Here are a few pics, courtesy of Nick J Online. I want to start off by saying thank you to Jordan and Billy from JDRF. Billy was the cameraman and Jordan was the reporter who covered our 3D Movie Premiere in Los Angeles for Nickssimplewins.com. You two did a great job and if you haven’t checked it out go to the video section and see all the interviews they captured on the carpet. We are currently doing one of my favorite parts of being a Jonas Brother. . . recording! The creative process of writing and recording music can be very relaxing, especially when everything around us is going 100 MPH. I can’t wait for all of you to hear the new music. We already have 8 - 9 songs done for the next CD. Last week I spent a day with my partners from Bayer. We spent all day planning everything we are going to bring you this year. It was a very long day which included a photo shoot and video shoot along with some brainstorming sessions. They also previewed some new products and programs we will be launching. You’ll learn more about those in the coming months. I have included a couple shots from the day. Time to head to the studio; don’t forget to watch us on the Kids Choice Awards this weekend. My Simple Win this month? Creating new music for our fans to enjoy. 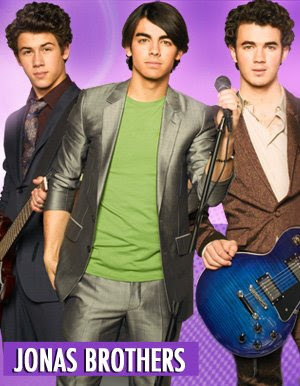 Perhaps that poor showing in the box office didn’t signify the Jonas Brothers were done after all. The reason for the Disney megagroup’s poor turnout for their movie, Jonas Brothers: 3D Concert Experience, is becoming rather apparent. Their tour—you know, the thing where you pay a lot more but you get to see them in person in a giant room with tens of thousands of other screaming fans—has sold out huge arena venues in many major cities, including New York, Los Angeles, Chicago, Philadelphia, Houston, Pittsburgh, Edmonton, New Orleans, Atlanta and Washington, D.C. In fact, the trio sold more than 800,000 total tickets when the shows went on sale this weekend. 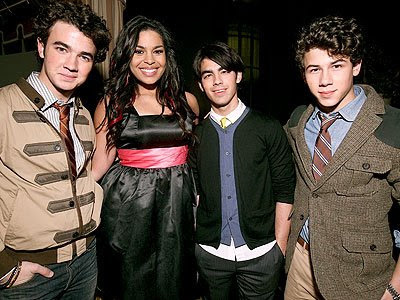 Jordin Sparks, as well as Honor Society, are joining the boy band for the North American leg of the tour, while Demi Lovato will help them kick off the festivities in Latin America in May. The good news follows the siblings’ big win for Favorite Music Group at the Nickelodeon Kids’ Choice Awards Saturday evening. A funny thing must’ve happened on the way to the Nickeodeon Kids’ Choice Awards 2009 this past Saturday. Seems like Joe Jonas tripped and fell on a pair of scissors, stood up and turned into Adrian Grenier 2.0, except exponentially better looking, in my opinion. Don’t get me wrong — I wouldn’t kick Adrian Grenier off my flip-n-…er… friend! for eating Lunchables, but Adrian’s hot 50% of the time, and the other 50% he kinda has a weird ape-like express that makes me feel like I can’t really trust him, whereas Joe Jonas looks good ALWAYS. Anyway, what’s your take on Joe Jonas’ new haircut? I mean CLEARLY it’s MILES above Camp Rock, and it also looks a little easier to maintain next to what I’ll refer to as his A Little Less Longer hair, since this is clearly his Lines, Vines And Trying Times (or whatever the new Jonas Brothers album will be called) look. Leave a comment below, and tell me whether you love Joe Jonas’ new hair, hate it (traitor! 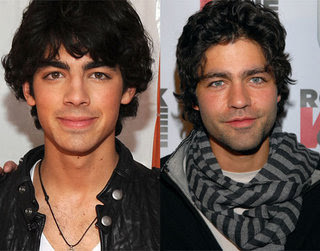 ), or prefer Adrian Grenier, and why! NEW YORK, March 30 /PRNewswire-FirstCall/ — Jonas Brothers’ explosive growth as a touring band was affirmed this weekend when multiple dates on the North American leg of their upcoming world tour quickly sold out. Fans of the Grammy nominated band purchased over 800,000 tickets, resulting in sold-out arena shows in major cities including New York, Los Angeles, Chicago, Philadelphia, Washington DC, Houston, Pittsburgh, Edmonton, New Orleans and Atlanta. Second dates were immediately added in Los Angeles, Chicago, Philadelphia and Vancouver. 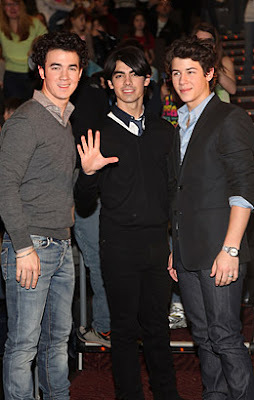 In addition, the Jonas Brothers sold out five arena shows in the New York area to meet the tremendous fan demand. 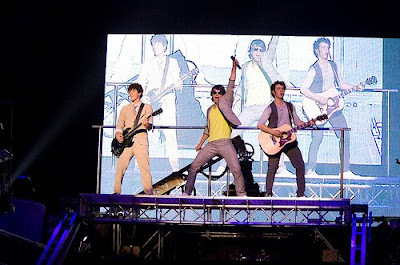 “The Jonas Brothers Worlds Tour 2009? is presented by Burger King and produced by Live Nation. “The Jonas Brothers World Tour 2009? the band’s most ambitious production yet and will include a massive 140-foot plus stage centered in the arena that aims to give a larger number of Jonas Brothers’ fans a closer, more interactive live concert than they’ve ever experienced before. This weekend, the Jonas Brothers also revealed a first look at their new stage on their YouTube channel at www.youtube.com/user/JonasBrothersMusic. The show will feature cutting edge technology used in a one-of-a-kind circular water screen, multi-color laser effects, motion automated video screens, a giant crane levitating over the audience plus other surprises that will bring the tour to the next level of concert entertainment. Special guests American Idol winner and 19 Entertainment/Jive Records’ platinum-selling artist, Jordin Sparks and rising stars, Honor Society. “The Jonas Brothers World Tour 2009? will also take the band to three continents where they will perform their hits along with new music from their upcoming Hollywood Records album set for world-wide release on June 15th. Starting on May 17th in Monterrey, Mexico, Jonas Brothers will bring their world tour to Latin America for six dates in countries such as Peru, Chile, Brazil and Argentina. Hollywood Records artist and star of the Disney Channel original movie “Camp Rock,” and the television series “Sonny With A Chance,” Demi Lovato, will be opening all Latin American shows on “The Jonas Brothers World Tour 2009.” After a brief visit to Europe in June including sold-out dates in Madrid, Paris and London, the band will tour North America and then return to Europe for a full continental tour in October and November of this year. For the most recent tour dates and further information, please visit www.livenation.com or www.jonasbrothers.com. The Official Jonas Brothers Fan Club has a their very own twitter to regularly update you on news and information being added on Team Jonas. Note: This ISN’T the Jonas Brothers personal twitter account, they don’t have a twitter YET. But if you have a twitter account, follow them. If you don’t, just bookmark the url! And life is pretty good for Kevin these days — the Jonas Brothers recently announced a world tour, and his band of brothers won the Kids’ Choice Award for Favorite Music Group at last night’s event. 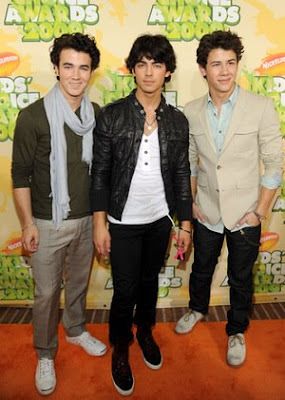 Thank you for voting so much and giving us the Best Group Award (BLIMP) at the 2009 Kids Choice Awards. You are so awesome and mean so much to us. Thank you…. Also, thank you for making our 2009 World Tour ticket on sale a big success. You are amazing! We do not take it for granted that you sacrifice and give so much. We hope to make this a concert experience you will never forget!!!! About to leave for the Honor Society, Alana Grace and KSM concert at the House of Blues in LA. Hope we see you there. The Jonas Brothers stopped to talk with the Dish Rag at the Kids' Choice Awards. They were all looking forward to meeting Hugh Jackman. Joe was wearing his favorite shoes, a pair of black leather YSL casual shoes. Not at all slime-worthy. Hope that green stuff washes out! We talked to Joe about having lunch with Camilla Belle this week. Are they dating? All his fans are dying to know if he's still single! "I don’t want to talk about that tonight,” Joe said. Are the brothers Twittering yet? “No, but everyone has been asking us that all night. We have to start doing it!" What will they do later tonight? Stop by snarky blogger Perez Hilton’s 31st birthday party at the Viper Room? Um, no. They plan to see their new pals, the Honor Society, perform. And then they’re going to see their idol Prince perform at his party. Do the JBs have any stalkers yet? THE JONAS BROTHERS WON “BEST MUSIC GROUP”!!! * ARRIVALS - Around 3:30pm, Honor Society, JB’s friends and opening act were spotted hitting the orange carpet. Around 3:45pm, the Jonas Brothers arrived with family and little brother, Frankie. Not that long after, friend and past opening act, Demi Lovato hit the orange carpet. * KCA’S INTERVIEW CAM - Jamie Foxx and David Archuleta were talking backstage on the interview cam about the Jonas Brothers and how they thought it was so funny how all the teens were screaming and flipping out everytime they were mentioned. * SLIME - As much as many know, Jesse McCartney got slimed, the Jonas Brothers get slimed near the end of the show when the big slime comes out of the stage. The Jonas Brothers pose with Ernie D at the Radio Disney headquarters on Friday afternoon (March 28) in Burbank, Calif.
Purchase Your Jonas Brothers World Tour Tickets NOW! Today is the official day the mostly all the US tour dates and tour dates between May to August are ON SALE PUBLICLY. Head over to Livenation, Ticket Master, or the other sites that selling the Jonas Brothers tickets and purchase yours. Be careful for spam or scalper sites! Make sure you get all your stuff ready and logged into your account to get tickets at the LOCAL TIME the ticket site says when they are selling it. For more details, check Team Jonas’ Ticket section or FAQ/Help section. 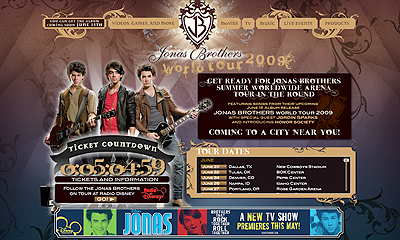 Disney changed their website on the Jonas Brothers to relate to their World Tour 2009. It will have a bunch of stuff added to it, so make sure you bookmark the site and keep checking back at it. 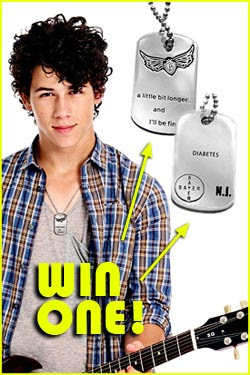 Nick Jonas designed these special Diabetes dog tags for anyone who wants to show their support for the disease. To show our support, JustJaredJr.com is giving THREE lucky readers a chance to win the dog tags. Dog Tag Details: Both versions are silver-plated with a line from The Jonas Brothers‘ song “A Little Bit Longer.” On the back there is a “NJ” and Bayer Diabetes Care logo, to signify their partnership which helps increase awareness of juvenile diabetes. On the diabetes version, the word “diabetes” displays on the back to show your personal fight against the disease. You can also purchase your own dog tags at Nick’s Simple Wins. Half of the proceeds of each sale will be donated by Bayer to the JoBros Change for the Children Foundation. HOW TO ENTER: Leave a comment here (leave comment on Just Jared Jr.) with a valid email address (will not be published) and THREE winners will be chosen at random at the end of the contest. This contest ends on Thursday, April 2 @ 11:59PM EST. USA Only. Enter as many times as you want!!! Good luck! 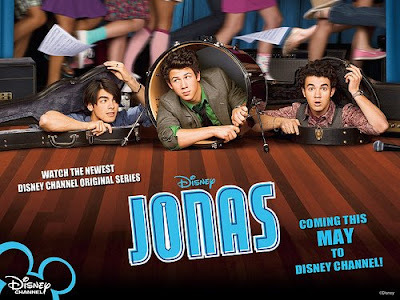 The premiere date of JONAS, the TV series will be Saturday, May 2nd at 8pm on Disney Channel. According to an AD putting in the new Seventeen Magazine. Published by Tamar Anitai on Friday, March 27, 2009 at 3:30 pm. Jonas Brothers Tour in Latin America–Presales Begin TODAY! Team Jonas members, when fan club presales begin for your city, go straight to the Team Jonas Tour page on TeamJonas.com, and click on the show you want to get tickets for. Not yet a member of Team Jonas? Visit the official website now to learn about how to join the club today and get access to presale tickets, messageboards, contests and more!? ?Remember that Team Jonas is a fan club, not a ticket club. Premium and Community Membership includes access to ticket presales, but Team Jonas cannot guarantee location or availability. Check out the Team Jonas Help/FAQ section for additional information about presales. 03/26/09 - New Presales Tomorrow! 2nd show in Vancouver BC, and a 3rd Uniondale NY show! By overwhelming demand, two more JONAS BROTHERS SHOWS have been added; a second show in Vancouver BC, and a third and final Uniondale NY show. Presales begin 9am(local) for Team Jonas! 03/26/09 - JB in Latin America! Check out the Tour section for news of upcoming presales in Mexico, Chile, Argentina and more! And don’t forget to send a shout-out! Now the Jonas Brothers. You’re going on tour with them. How exciting! I am so stoked. What I’ve got confirmed so far are the U.S. tour dates, and it is a pretty long tour. I think it’s close to 50 dates, and they keep adding more. I met them a couple years ago, and they are really great people. We’ve kept in contact and our paths have crossed. I am very excited to go on tour with them. It’ll expose me to a whole bunch of other fans. Are you ready for the romance rumors to start? Because you know they are going to. That is so funny, because I have had so many people tell me that, and I am like, “Oh great, here we go.” It is really funny but I am ready…Bring it on! So which one would you prefer to have the rumor with? We asked Joe FIVE random questions. He had a great time with them and (as you can see) had us ROLLING with laughter with some of his answers (specifically the one about his biggest adventure!) Here’s what he said! Q: Do you have quirky habit? Joe: I always shut our closet door before I go to bed. I don’t know why, and our door. I don’t know why. I just shut them. Maybe there’s like something weird – everybody’s got their thing to do. That’s kind of my thing, you know? Joe: I love my grandma’s homemade pizza. First of all, you’ve gotta say your grandma’s pizza is better than any pizza in the world. But it is the best because, she’s Italian. It goes over well. Q: What is the most adventurous thing you’ve ever done? Joe: I’ve gone to the moon twice now. It’s been very exciting. The first time it was actually filmed in a studio and the second time we actually went. Besides the moon, I would have to say… you know what? I’m going to stick with the moon because no reader will absolutely believe me but it will also be hilarious so… come on. Walking in my backyard to the moon. Q: What is the weirdest rumor you’ve ever read about yourself? Joe: That I like girls that wear chocolate chip lip-gloss. Joe: I would be able to go anywhere at any time. All I would have to do is close my eyes and I’m at the place. I could be like, sitting down on the couch and be like, “I really want a Slurpee” and bam! I’m in 7-11 getting a Slurpee and then back to my room. That’d be sweet. Pretty cool, huh? Which of Joe’s answers made you laugh the hardest? Yes, JB Fandemonium is aware of this rumor. I do not like posting about their personal lives, but this rumor is becoming a problem. I seriously don't think it's fair to them that rumors are being told about them, and sites a quickly picking them up. If you ask for my opinion, I think this is sounding completely FAKE. People need to stop thinking that even though a celebrity hangs out with someone, that it means that they are dating. Pictures spread across the media are old, but the rumors are spreading even quicker. Just to clear things up, rumors are not at all true! At 2:42 Joe gets arms wrapped around his neck by a fan. After it, he goes straight to the In-Ear microphone and talks to his people. I wonder what he said? CRASH OF FANCLUB SERVERS, PRICE OF TICKETS, AND THE BEST TOUR EVER! After the fans of Phish and Bruce Springsteen, now those of Jonas Brothers face problems with regard to ticket release. Yesterday, the newly launched Team Jonas fan club website crashed. The reason: an enormous demand for the passes to North American concerts. With thousands of Jonas Brothers’ fans hitting the website for collecting tickets to the upcoming tour of their music heroes, it failed to run smoothly and broke down. Though many fans managed to get tickets before the crash, the incident caused much trouble to those who wanted tickets. Howvever, upper deck tickets will be availably for the next 36 hours. Passes for the next U2 show will be released tomorrow. Lets hope getting those will not be as much trouble for U2 fans. Next year, I think Team Jonas should give different days for the dates. Like more than just 2 days! Trying to get all those dates in just ONE day - it was BOUND to lead to this! Sorry, Gabriella. Your mom won’t be taking you to see the Jonas Brothers in concert this summer. When Lili Scarpa saw what it would cost for her 10-year-old daughter to see the heartthrob rockers again this year, she got sticker shock. Last year, she paid $47.50 at Target Center, and the comparable ticket will run $89.50 for a July 8 return engagement. Tickets, priced from $29.50 to $89.50 (plus fees), go on sale at noon today at Ticketmaster outlets and Target Center. OMJ! 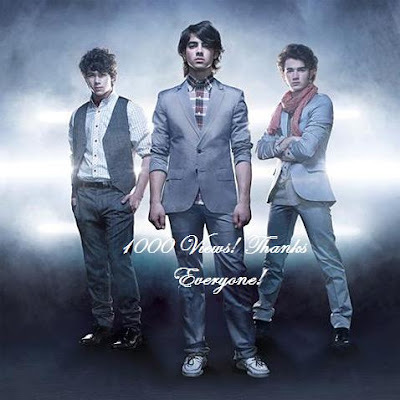 Jonas Brothers Fandemonium has reached 1000 views! Thanks to everyone! I hope you all are liking the site and I hope for many more to come! Thank You Again! Don't forget to tell everyone about JB Fandemonium! 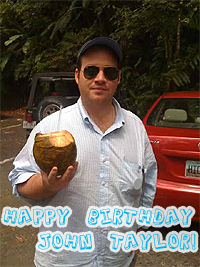 John Taylor is celebrating his birthday in Puerto Rico. Send out your birthday wishes! You never know who reads them! Special Announcement! Info on Ottawa, Ontario Concert! SPECIAL CONCERT ANNOUNCEMENT for OTTAWA, ONTARIO!!! Disney came out with a new commercial. Jonas Brothers shot new promos for their new TV show JONAS and they are shown here in this new promo that aired during March 22’s new Hannah Montana. It promotes their Radio Disney Takeover on Friday (March 27) 7et/4pt! In their ongoing attempt to leave nary a single 12-year-old heart unmelted, the brothers Jonas recently unveiled plans for a worldwide arena tour. With a slew of Canadian dates planned on their new theatre-in-the-round type stage setting, the mop-topped, world-domineering boy band recentlyexplained themselvesto a gaggle of press on a North American conference call. Selling the boys has been a brisk business. Their recently released 3D IMAX movie quickly became the second highest grossing concert film of all time. In fact, it’s a bona fide bubblegum moment: the highest grossing concert film ever was released last year by Miley Cyrus, and the boys appear several times in her film. While pundits profess that the music industry is dying, it seems a 12-year-old girl with a credit card and a crush will still find her way to the store. However, such fandom may not be as feverish as in the late ’90s, when teen pop queens and kings ruled the world. The brothers have recently been holed up in the studio, working on their fourth album, due out June 15. They talk about the thrill of performing with Stevie Wonder at the Grammys and how they’ve been influenced by Elvis Costello, Johnny Cash, Neil Diamond and Kings of Leon. But the New Jersey-bred, Texas-based pop stars also realize they’re as popular for their hairdos as they are for their sound. Furthermore, perhaps inevitably, their personal lives have become grist for the mill. Though they claim to be virgins and all wear purity rings, their rumoured canoodling with everyone from Miley Cyrus to Taylor Swift to that man-eater from The Hills, Lauren Conrad, has threatened to sully their image as choir boys. The boys (and their management) are certainly striking while their iron is hot. Besides the concert film and JONAS, their upcoming TV show, they have also appeared on Saturday Night Live and played for U. S. President Barack Obama’s daughters, Malia and Sasha, at the White House. Of course, there was also a nasty South Park episode, in which Mickey Mouse gave the brothers a beat down, but the boys contend they’re no puppets on a string. Thus far, it’s hard to argue with a game plan that has made the Jonas Brothers North America’s favourite new pop band. And there’s no reason to believe that those unconvinced 12-year-olds in places as far-flung as Peru, Belgium, Ireland and Spain will be able to resist their easy hooks and smiles on a new world tour. This summer, the concert rolls through Canada. Moms and dads, you’ve been warned. - The Jonas Brothers recently announced Canadian tour dates for the coming summer, including Vancouver, GM Place, June 30; Edmonton, Rexall Place, July 2; Winnipeg, MTS Centre, July 5; Montreal, Bell Centre, Aug. 29; Toronto, Rogers Centre, Aug. 30; Ottawa, Scotiabank Place, Aug. 31. For further details, visit jonasbrothers.com. Alexandra Ferrara, 13, has travelled to California and the Bahamas in order to see the Jonas Brothers in concert. Alessia Dzwigala is 12 and wants to see her first Jonas Brothers concert this summer, suggesting she’ll open a lemonade stand to earn ticket scratch. We asked Alexandra and Alessia to give us 13 reasons why the boys are rapidly taking over the world. 1. They’re all pretty hot, like, gorgeous. Especially Nick, the youngest, in a cute kind of way. 2. It looks like they’re having a lot of fun on stage. During the Burning Up tour, Nick decided to do a lot of flips. We were like, “What!” Fans didn’t even know that was something he could do. 3. I loved the 3D concert movie. They’re so awesome at playing guitar. 4. They always do charity stuff, and that shows their softer side. 5. They dress pretty nice. I mean, for boys. 6. They’re pretty new and they’re really famous, but they just got their big break and they’re still progressing. They have a long way to go, but it’s fun when a group is new. 7. My friends, my cousins and everyone I know loves them, too. 8. Even my mom is a fan — well, she says she is. I don’t have to demand anymore for her to take me to shows. 9. They’re big inspirations. They say be confident in yourself and don’t worry about what others think. 10. I think they have nice parents. That’s what my mom says. 11. They care about their fans. They’re always signing autographs and always smiling. At their concerts, they point into the crowd and make everybody feel really good. 12. They write good songs like Can’t Have You. That song has a lot of meaning, like if you’re saying there’s a girl you like that you broke up with, but they know they made a mistake, but now they can’t see that person anymore. That’s never happened to me. I’m only 13; I still have a long way to go. 13. They’re more than gorgeous — like, better. I love them with all of my heart. Hollywood’s top celebrity psychic has urged the Jonas Brothers to bless the mansion they’re hoping to buy - because it’s full of dark spirits. The trio have their sights set on the former home of Tinseltown star Marion Davies, which is one of the city’s listed buildings, but psychic-to-the-stars Kenny Kingston insists the estate comes with an eerie past, including high-profile affairs, illegitimate children, outrageous parties and a mysterious fire which almost wrecked the old place 20 years ago. After learning the Jonas Brothers had put in an offer for the Beverly Glen-area address, the psychic held a seance to ask if the spirit world had any information about the Davies home. Kingston, who agreed to bless the home where tragic client Marilyn Monroe died - despite warnings the actress would never be happy there, has offered to cleanse the Davis mansion for the Jonases. The Jonas Brothers have reportedly already bought Armani Casa furniture for their new pad, which sits across the road from the family’s existing Hollywood Hills compound, even though the sale has yet to go through. The boys have reportedly hired top house designer Kenneth Bordewick to advise them on the decor. Sources claim Bordewick has already taken a walk around the grounds. And Kingston fears the place is still prone to a devastating blaze. The brothers have reportedly already bought Armani Casa furniture for theirnew pad, which sits across the road from the family’s existing compound, even though the sale has yet to go through. The boys have reportedly hired top house designer Kenneth Bordewick to advise them on the decor. Sources claim Bordewick has already taken a walk around the grounds. From Deco Films: It’s either one of these houses. This first house is located at 1700 Lexington in Beverly Hills. It was the first home Marion occupied when she moved to LA. 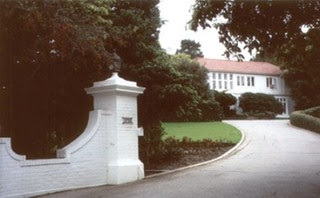 The second one is located at 1011 Beverly Drive and is shrouded in trees on a hilltop. The driveway is a sharp uphill slope with the pool going up the side of the hill in three layers. The Bodyguard was filmed here. PopstarOnline is excited to have an exclusive chat with the director of the JoBros instant-classic music video for “Lovebug,” Philip Andelman! His answers provide some fun insight into the making of the video and into how the boys work as we all get revved up for their summer WORLD tour! PopstarOnline: How did you get to be a music-video director? Philip: I went to film school, graduated, was unemployed, started fetching coffee on music video sets and after a month a director found out I’d worked for one of his favorite photographers and said, “Come shoot for me!” I’d never operated a 35mm film camera and told him this and he said, “Don’t worry, we’ll give you a crew that will take care of all that…just frame up some great shots!” Two weeks later, I was in Houston shooting cars for a hip-hop video. I wound up shooting second unit (everything not involving the band) for this director for two years and learning everything I now know. Eventually, I began booking my own little videos and slowly worked my way up to the JBs! Philip: A month or so before, I did a video for Demi Lovato which the label [Hollywood Records] and management (same management) were very pleased [with] so they asked if I’d be interested in working with the Jonases and I jumped at the chance! PopstarOnline: Did you come up with the yesteryear concept? 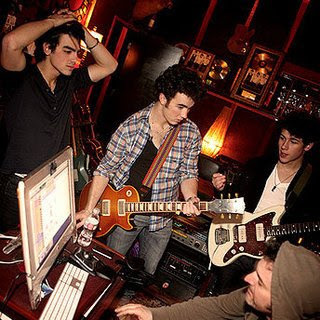 PopstarOnline: What was it like working with the Jonas Brothers? What were each of them like personally? Philip: It was a blast. They are some of the most professional people I’ve ever had the chance to work with. They retain a wonderful, youthful playfulness and combine it with meticulous focus when necessary. PopstarOnline: Do you think they’re good actors? PopstarOnline: When filming, did fans find out where you were, and what if any fan incidents were there? Philip: I was a bit sheltered from all the fanfare and remember on the first day stepping out of the ballroom for the first time after shooting for about six hours and seeing cops, security, paparazzi, etc., and being shocked. I literally had no idea any of that was happening. When we shot out in the middle of the ocean, there were literally boats of photographers following us. It was crazy! PopstarOnline: Where did you film and how did you choose the locations? Philip: We shot at the Cicada Restaurant in downtown L.A., which we converted into the grandparents’ apartment and ballroom, and then down in San Pedro on the second day to find the house, boats, beaches, etc. The Cicada ballroom was my executive producer’s incredible idea, and the other locations were all found by our location scout/manager. PopstarOnline: Did you cast Camilla Bella or how did that occur? Philip: I asked the band for a list of dream choices for the part and Camilla was at the top of the list and we were all really excited when she agreed a few days later! PopstarOnline: When Camilla showed up on set, was that the first time they all met? What was that like? PopstarOnline: Did you get to meet Selena Gomez? What was she like? Philip: I’ve never met her. PopstarOnline: Was there anything you shot that was not used? Philip: TONS!!! We shot about three hours of footage for those three minutes!!! This is the new JONAS Photoshoot Promo! Credit goes to Nick J Online! Talk about a Jonas bonus: This spring, in addition to debuting JONAS, a Monkees-style Disney series full of original tunes, the Jonas Brothers will also release their third full-length, tentatively titled Lines, Vines and Trying Times. With help from producer John Fields, who worked on their previous two LPs, the Jonas Brothers decided to explore a few new sounds, like the horn section that fleshes out the Weezer-ish “Poison Ivy” — a tune about a toxic girl you can’t resist. With the Jonas Brothers on the verge of embarking on their first world tour, the trio recently held a conference call to discuss their new concert arrangement, their Monkees-inspired JONAS television show and their new June album. “The tour will be in-the-round,” Nick Jonas tells Rock Daily about the arena shows that will plant the band at center court. “We’ve always talked about wanting to do a tour like that, and this has been our first opportunity. It’s a way for us to really connect with our fans.” The tour will kick off this Sunday, March 22, with a show in the Bahamas, after which the JoBros will invade South America, before returning to North America and then heading to Europe. THE JONAS BROTHERS MILKSHAKE REVEALED! PLUS: NAME THE SHAKE! Published by Tamar Anitai on Friday, March 20, 2009 at 12:21 pm. A few weeks ago I Twittered about a Manhattan restaurant that created a special milkshake for the Jonas Brothers when they were in New York this past summer. Jonas fans, your Twitter reaction to the Jonas milkshake was cuckoo bananas — you wanted to know about the restaurant, where in the restaurant the Jonas Brothers SAT, the milkshake recipe, the exact measurements of the millimeters of milk needed, etc. etc. Katie also told me that the Jonas Brothers loved the shakes so much that they requested to meet her in person to thank her. Ridiculously adorable, right? Of course. So, there’s the story of the Jonas Brothers milkshake. Now, watch Katie show me how to make Olana’s yet-unnamed Jonas Brothers milkshake, and follow along at home if you’ve got a billion fudge brownies sitting around — the recipe’s after the jump! Also, Katie is SO cool that she offered to let Buzzworthy’s Jonas Brothers fans NAME the Jonas Brothers milkshake. Leave your suggestions in the comments, and I’ll let Katie know my favorite (it’s not a fancy or formal contest or anything… just submit some fun names, mkay? ), and they’ll put it on the menu at Olana! Sweet! Method: Combine the chocolate ice cream, fondue, milk, and brownies in a blender. Blend until smooth. Pour into chilled glasses and top with whipped cream and chocolate chips. Method: Bring the heavy cream and sugar to a boil in a small saucepan. Pour the hot liquid over the chopped dark chocolate and salt. Whisk to combine. Check blood sugar! PRO: The New Jersey trio racked up more than $60 million worth of allowance money last year. Plus, they’re remarkably scandal-free (we looked). CON: Teen-pop fans are notoriously fickle — they’re devotees one day, jaded turncoats the next. And the boys have yet to break through to an adult audience, which could give them treasured credibility. Joe Talks Tour - Shortsleeves / Tank Tops / Shirtless?! If you read teen magazines or frequent fangirly Web sites, you’ll know that Joe Jonas usually gets labeled as “the cute and funny one” of the Jonas Brothers. Think of him, then, as a combination of Paul McCartney and Davy Jones (cute), and Ringo Starr and Micky Dolenz (funny), who previously held those titles during adolescent frenzies over the Beatles and the Monkees. Jonas, 19, doesn’t seem fazed that two boy-band torches have been passed his way. The JoBros are experienced multi-taskers, accustomed to working on CDs and tours and TV series and movies and a book, pretty much all at the same time. Now his band is headed to Birmingham’s BJCC Arena on Aug. 16, as part of a world tour that will travel to 44 cities in the United States and Canada. The Jonas Brothers will make some stops in Europe and South America as well. This particular Jonas - who rules millions of hearts along with sibs Kevin, 21, and Nick, 16 - is on the phone and willing to talk about the labels attached to the band members. He’s also game to chat about the fans, the shows, the goals and anything else that will fit into an 18-minute conversation. So, how does Jonas feel about being called the cute and funny one? Or about the capsule images attached to each of the Jonas Brothers? 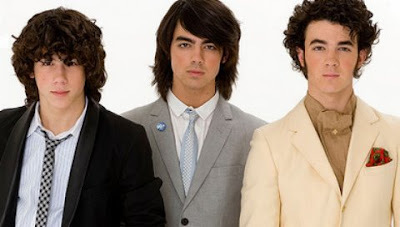 So, then, for the uniformed: Kevin is “the cute and romantic one,” and Nick is “the cute and sensitive one.” Cute, of course, is the unifying factor, and it has helped the Jonas Brothers to become a breakthrough sensation over the past couple of years. These pop-rockers from New Jersey are undeniably hot, with a No. 1 album in 2008, “A Little Bit Longer,” several Top 10 singles, a handful of Teen Choice Awards and a Grammy nomination as best new artist. They’re all over the Disney Channel, playing in cinemas with a new 3-D concert film and linked to teen phenoms such as Taylor Swift, Selena Gomez, Demi Lovato and even Hannah Montana herself, Miley Cyrus. When it comes to live performances, bookings for the Jonas Brothers tend to sell out quickly, and the venues they dominate have leapfrogged in size from malls and amusement parks to arenas and stadiums. Jonas says he isn’t at liberty to discuss the special effects touted in the tour announcement, which will include a circular water screen that’s supposed to be one of a kind. Nor is he positive that the Jonas Brothers can beat the Backstreet Boys, who made a spectacular entrance at the BJCC in November 1999, flying from the ceiling on neon-lit surfboards. The Brothers’ publicist does reveal a few specifics: a 140-foot stage, multi-colored lasers and a giant crane that will levitate over the audience. Every high-tech gizmo employed by the band has one ultimate purpose, Jonas says, and that’s “connecting with the fans” in the most thrilling way possible. Bear in mind, however, that the Jonas Brothers remains a family-friendly ensemble. That means setting strict limits on stage behavior and exposed skin. In the past, for example, other boy bands have been known to strip off their shirts during performances and flaunt their buff bods, inducing shrill screams of approval. In the middle of recording their fourth album, the Jonas Brothers revealed that they hope the new material will show fans and critics that they’re growing as musicians. The guys are once again working with their longtime producer, John Fields, and cite Elvis Costello, the Zutons, Kings of Leon and even Neil Diamond as influences for the record (due June 15). 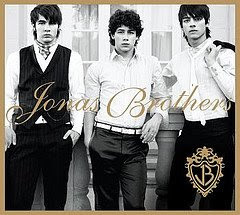 Kevin described the overall message as “the same old Jonas Brothers, in a sense,” but added that it would have “different musical instruments that are going to add and build to the sound we already have,” including horns and strings. Eventually the brothers did get to the good stuff — their love lives — revealing that their busy schedule, which includes an upcoming summer tour, makes it hard for them to date. But, they said, they do manage to make time occasionally. Posted By: TEAM FFE - 1 hour agoHey FanFamily! PLEASE NOTE: The FanFamily must enter the password - - - - - - - - - on the ticket purchase page. Now you can get up to 6 tickets per guest! **PLEASE NOTE: I didn’t put the actual password for a real purpose. Please take the time to go log into your FFE account and view the bulletin/new updates there. Please DO NOT be rude and pass around the code, let people go into their account! The Jonas Brothers are nearing completion of their fourth album, due out June 15, which the trio says will take the band in some new sonic directions. Other inspirations the trio cited for the new album include the Zutons and Kings of Leon, as well as Neil Diamond, who the Jonases saw perform when they took part in the MusicCares Person of the Year tribute during Grammy Awards week last month in Los Angeles. 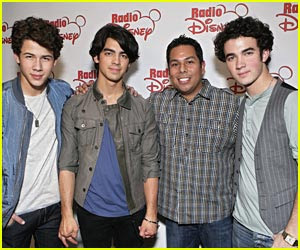 Nick said the group has already record nine songs with “a few more to go.” John Fields is again producing the album, which was recorded concurrently with the filming of the trio’s new “J.O.N.A.S.” action/adventure/comedy series, which is due to debut in May on the Disney Channel. Several songs from the album will be featured in the show as well. JONAS BROTHERS ALBUM AND 2009 WORLD TOUR NEWS! PLUS: RIDE ALONG WITH THE JBS! + The Jonas Brothers’ new album and the follow-up to A Little Bit Longer, will most likely be out June 15! The album title is still under wraps. (Until it isn’t.) As Diddy likes to say, GET READY! + The Jonas Brothers 2009 world tour’s gonna be in the round, which means every seat’s gonna rule! No word on whether or not foam will be involved. + Nick said he wants to go to college some day, maybe at Northwestern. (This just in: Northwestern apps increased by 17 billion!) But we already knew that Nick Jonas <3s Chicago. Refer back to August 9, 2008, Day 2 of MTV’s “Jonas Brothers: Live & Mobile,” when the Jonas Brothers were driving to Madison Square Garden with their parents, and Nick told us he wants to live in Chicago someday. See people? I am A WALKING ENCYCLOPEDIA OF JONAS BROTHERS KNOWLEDGE! -Jonas Brothers new album is dropping June 15th! -The guys say their show is going to be bigger and better in the round with more seats that will be like a front row ticket! -They are 9 songs into their new album! -Kevin says the tour is all new songs, all new stage set up and they can’t wait for all of you to come out and see them! -Joe says they love Canada! They have a great time up there. They are excited to go to cities they have never been to. -The guys hope the President and the first family comes to their DC show! -Kevin says they always have an extra bunk or two on their bus for friends and family to visit while they are on the road. -The guys say they don’t have a twitter yet but they might get one. -Kevin says the stage is 144 feet end to end! -Nick just spilled that he would like to go to college and has talked about going to a school in Chicago when he’s ready. -They are talking about Honor Society! -Joe said Sasha and Malia Obama are welcome at their show! -They said they are looking into more creative ways to meet the fans, and always appreciate the fans support! -Joe said he was happy with the sales from the 3D movie and happy the fans came out to support them! Nick would “love to go to college,” maybe in Chicago at Northwestern! -They are very excited about their new album, coming out this summer! 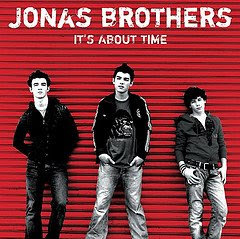 Okay, so the new title of the Jonas Brothers’ fourth album is to be named: Lines, Vines and Trying Times! This is great news! It sounds very mature and a well thought out metaphor of their life. Here’s what Nick has to say about the title and what each word means to him and his brothers. With a title that interesting, I hope the album artwork is just as powerful. 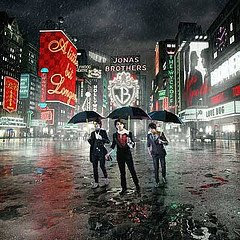 Do you like the title of the Jonas Brothers’ fourth album? Kevin Jonas was spotted shopping for baby clothes at an extremely trendy baby boutique in West Hollywood called Bel Bambini. From a worker: 'I don't get star struck easily at all since we have pregnant celebrities come in on a daily basis, But a couple weeks ago I was shocked to see that Kevin Jonas came into our store. Kevin was with the cutest pregnant blond, I caught her name later on it was Sarah [Everhart]. Kevin must really love this girl and her baby that she is about to have because he dropped an easy $4,000 in our store. We are not supposed to ask our clients questions, but my manager started talking to them and he's going to be her baby girl's godfather. Her little girl is going to be spoiled by Kevin! Looks like Kevin is going to be a great godfather and a great father in the future! Anyone who has a teenage girl will want to know this, but before reading further, hide your wallets. June 20 will be a day things get out of control out at Collins and Randol Mill. Here’s the release verbatim from the Cowboys PR office about the upcoming Jonas Brothers concert, which will be making a stop in Arlington. You can see every concert date after the jump. God help all of us fathers out there. Los Angeles, CA - Grammy nominated and platinum-selling recording artists, Jonas Brothers, today announced the dates and cities for “The Jonas Brothers World Tour 2009.” The tour, which will take the band to three continents, will feature new music taken from the June 15 worldwide release of their upcoming Hollywood Records album. “The Jonas Brothers World Tour 2009,” presented by Burger King®, kicks off in Dallas at New Cowboys Stadium on June 20 and will take the band throughout the United States and Canada. In addition to their 44-city North American trek, Jonas Brothers will also play three European dates including recently sold-out shows at Paris’ Zenith Arena and London’s Wembley Arena plus a just-added date at Madrid’s Palacio De Deportes. Additional European shows will be announced soon along with debut tour dates in South America. “The Jonas Brothers World Tour 2009″ is produced by Live Nation. On Monday, March 16, Team Jonas fan club members in select cities will have the first opportunity to buy tickets to the summer tour. A pre-sale for CITI® card holders in select cities will begin on March 18 through CITI’s Private Pass® program, for complete details visit www.citiprivatepass.com. Tickets for the general public in select cities will be available beginning March 20 and can be purchased at www.livenation.com. Check www.jonasbrothers.com for specific cities and times for pre-sales and public on-sales. 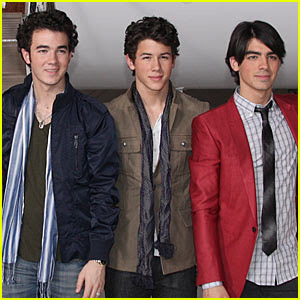 “The Jonas Brothers World Tour 2009″ will present the band’s most ambitious production yet and will include a massive 140-foot plus stage centered in the arena that aims to give a larger number of Jonas Brothers fans a closer, more interactive live concert than they’ve ever experienced before. The show will feature cutting edge technology used in a one-of-a-kind circular water screen, multi-color laser effects, motion automated video screens, a giant crane levitating over the audience plus other surprises that will bring the tour to the next level of concert entertainment.